During the late sixties, the war film became a popular genre amongst European filmmakers. 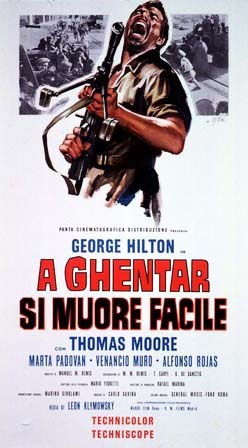 In the main, these were influenced by the likes of The Dirty Dozen (Dirty Heroes, (Dalle Ardenne all’inferno, 67)) or The Guns of Navarone (Probability Zero, ((Probabilità zero, 69)). Often, however, they incorporated aspects of the espionage or heist movie. A ghentar si muore facile probably does this more so than any other. At its heart it has a basic ‘revolution against a crooked dictator’ scenario, but the lead, caper-like character also brings it into the arena of the spy film. Wisecracking adventurer Teddy Jason (George Hilton) is hired by rebels from the Republic of Ghentar to retrieve a case full of documents from a plane that has crashed into the sea. He immediately has problems with the secret police, who seem to know his plans, and is forced to enlist the help of a fisherman called Botul. After a few more scrapes he is successful in his task, but surprised to find that the case is actually full of diamonds. Intending to keep them for himself he hides them secretly on the hull of Botul’s boat. 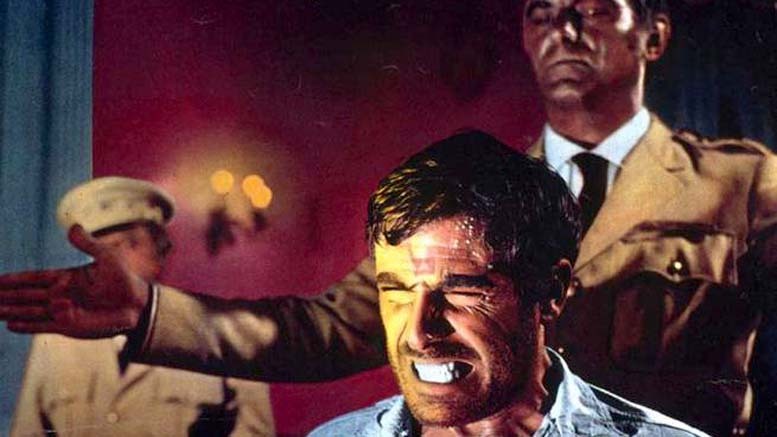 Unfortunately, he is promptly captured by the pesky police and, refusing to talk under torture, is sentenced to imprisonment in ‘The Mines of Paradise’ – a glorified prison camp in the desert. As well as suffering from the heat, exhaustive work and a period of solitary confinement, Teddy is also encouraged to talk by being tempted with a nice cool beer. This is frankly too much for a red blooded male to take, so he organizes a daring escape with some fellow prisoners. Escaping, however, is only the beginning of their problems: there is still a desert to cross on foot. After his companions have all died of thirst, Teddy is fortunate to be found by the men of Kim (Thomas Moore), a captain in the secret police who is in reality the head of the rebels. He agrees to help them out with their revolution in the hope that this will give him the chance to get his hands firmly back on the diamonds. An attack upon the cliffside headquarters of the Dictator Lorme (Alfonso Rojas) is planned. A ghentar is fortunate to benefit from an absolutely top-notch soundtrack, courtesy of Carlo Savina, which mixes a western-type title theme with some Arabian influenced tracks to great effect. Unfortunately, the same can’t really be said of much else about the film, which is resolutely mediocre. There’s some decent underwater cinematography, but beyond that it doesn’t really amount to much. Good assessment Matt – a very average film. The comments from George certainly illuminate.